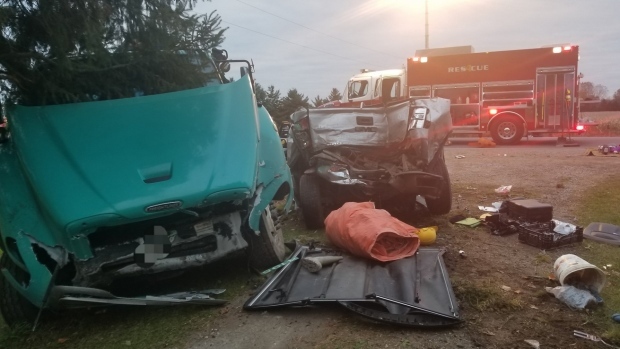 A 40-year-old Ingersoll man has died following a five-vehicle crash nearly two weeks ago that sent 10 people to hospital. Norfolk County OPP and emergency responders were called to the crash at Highway 24 and Norfolk County Road 19 East northwest of Waterford early on Oct. 25. An investigation found a southbound pickup truck was preparing to turn left onto Norfolk County Road 19 East when it was rear ended, causing a chain-reaction crash. Ten people were taken to hospital with various injuries, including a male passenger in a pickup truck who was airlifted to hospital with serious, life-threatening injuries. He was pronounced dead in a Hamilton hospital on Tuesday and has been identified as Kevin Coutts of Ingersoll. While he was in hospital, friends had set up a GoFundMe campaign to help his wife and two children. Coutts had been married just a few months. OPP say the investigation is continuing and charges are pending.